The 1990s were mostly an awesome decade with bitchin' cars. Unfortunately, some lameness crept still crept in. 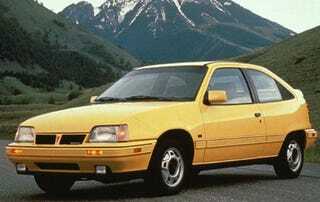 What's the worst car of the 1990s? BOW DOWN TO EARLY 1990s PONTIAC. Yes, we debated for a bit what early 1990s Pontiac product we'd use, given how crappy most of them were. For sheer audaciousness of name we've picked the Pontiac LeMans. What the LeMans has in common with the famous European race is unclear, especially in the early 1990s version. Perhaps they meant to call it the Lamaze, but the Korean engineers at Daewoo who designed the car were confused. Slow, crappy, poorly-built, unattractive. It's hard to believe the same decade that birthed the modern Internet and gave us Ronin also saddled us with this awful piece of tin. When was the last time you saw this generation of LeMans on the street? Aight, what you have that'll make us say "Whoa?"